Ok, I've been reading a lot about my maple and as per usual, getting a lot of contrasting information. This Trident is my best maple and is the one I want to spend most of my attention on. So here are a few questions. When to re-pot: Some say fall after the leaves drop. Some say spring just before budding. Which is better? Does it matter? Defoliating: I'd like to reduce my leaf size but the information I'm reading is highly contradictory. Some say never. Some say only once every two years. Some say half defoliation. Some say always defoliate the entire tree so the tree doesn't abandon those limbs defoliated. Very very confusing. And when would be the best time to defoliate? Pruning. I need ramification and shorter internodes. Is this better done when re-potting OR if I re-pot in the spring should I prune during dormancy? Or vice-versa for a fall re-pot (see re-pot question above) to prune just before spring? Wiring: Most of what I'm reading says wire during the winter while the leaves are off the tree. Yes, no, maybe so? Any help from anyone with maple experience or just overall bonsai knowledge would be highly appreciated. 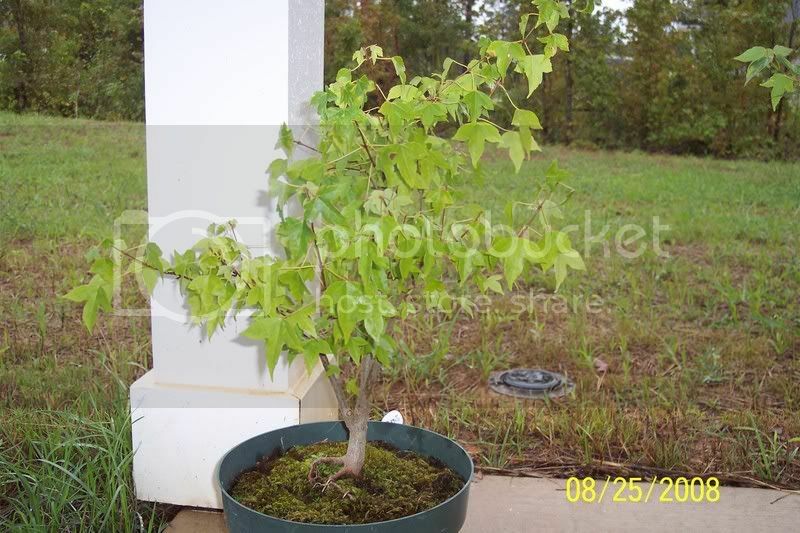 I repot maples in June or July, usually every 2-3 Years. First I defoliate the tree, then repot it, do a little pruning, and place the tree in a cool, shady spot until it leafed out. No fert for a month. This will reduce the leaf size. I would not defoliate until the tree needed a repot and never two years in a row. Usually, keeping leaves small is only a concern when tree is more or less 'finished' and growth is no longer a prime consideration. So, when ramification/trunk/(major) pruning is all said and done, reducing pot-size and/or letting roots fill pot will keep leaves on small side. Thanks for the info guys! So I'm basically going to leave it alone until spring. Then I'll probably have a whole new set of questions for you. Here is some info from Bonsai International.